Fed up of waiting for Cave Story to reach Europe? Well, your wait is nearly over: the game is Europe-bound on Friday, December 10th. The game's also set to be a little cheaper than its North American counterpart, launching at 1,000 Nintendo Points rather than the original 1,200 price, and will see a simultaneous release in New Zealand and Australia on the same day. The long wait is about to come to an end. AT LONG LONG LAST! I hope for DSIwARE VERSION TOO! Great news, yay for Europe and our friends down under! Great news. The lower price point means I only have to purchase one points card to buy it as well. Awesome, I'll get Flowerworks at the same time. First WiiWare purchases in months! Or I could just continue playing Cave Story for free on my Mac. FINALLY!!! Although, I'd rather wait for the dsiware version because it's portable. I hope it doesn't take as long as the wiiware version has. Great news, i will stop moaning now! Glad you guys finally get it. This was waaay overdue. Why is the release so close to other games such as DKCR & Super Mario Allstars? This could of filled the gap between Other M which was released the start of September. Cancelled my pre-order today for Mario Allstars anyway (see reasons why under the game thread re 50hz issues etc). Glad Cave Story is on the way. At last! Great holiday present for us! Still not sure about this game, hope we get the US demo as well. Can't find it. Link me to it or tell me here please. This is great news! Although I will put off buying it because a) I'd rather get the DSiWare version and b) I need to save my money after spending £100 on a giant Smugleaf plush. Finally, and fortunately with an excuse^^. Hmmm don't know if I'll bother anymore, seeing as I just got it in my pc for free. Maybe after Xmas. Still good to see its coming. Cool happy for you guys. finally! ...i'm off to buy a card! Now give us an exact date for Mario Party 2, Nintendo! I have 1000 points saved for it. I hope Cave Story also comes with a demo. 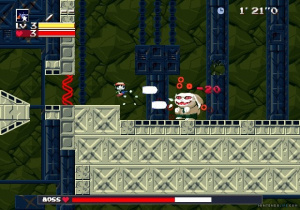 I'm probably in the minority here, but Cave Story wasn't that great. When I first played it, I couldn't get enough of it, but after a while, I got tired of dying and starting over at the beginning of the stage. (I guess I've become spoiled with modern day checkpoints.) It's not a bad game, and if you are looking for an old school experience, go for it, otherwise be warned. "Finally" is the word alright! Thanks. I was looking in the forums for the topic. So no wonder I didn't find it. Yay, cheaper and bug free!!! Ahh, finally Cave Story is released in Europe. Christmas comes early this year! Now if we buy it here en masse then maybe those Japanese will realize that they shouldn't ignore Europe. Oh, and it is not cheaper in Europe compared to America! America: 1200 points = 12 US$ = 9,20 Euro. Europe: 1000 points = 10 Euro = 13 US$. So it actually means that the prices are very similar! So the pricing is fair. Wow, I feel bad now about moaning when our American friends got a lower price, especially because they're being so nice about this. Now we just need the game on DSiWare! Ah, yes, you are right. I was thinking it's Japanese because the game is made by Daisuke Amaya. So it is a Japanese & American "conspiracy" to keep Europeans waiting. Hahaha! Anyway... I'm happy it's released in Europe too. Heh. I've been waiting ages for this, but now I wonder if I don't want the DS version! Yeah, just one another week... I'll get this on the first day. What a ridiculously long wait. ....Still gonna get it on DSiware, probably. If they don't make us wait another greater part of a year, at least!